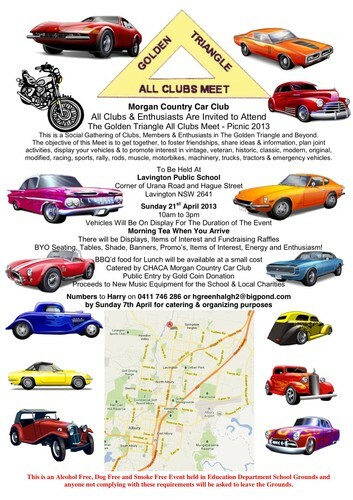 Hosted by the CHACA Morgan Country Car Club, Jindera. This is a Social Gathering of the Car Clubs, Members & Enthusiasts in The Golden Triangle and Beyond. The objective of this Meet is to get together, to foster friendships, share ideas & information, plan joint activities, display your vehicles & to promote interest in vintage, veteran, historic, classic, modern, original, modified, racing, sports, rally, rods, muscle, motorbikes, machinery, trucks, tractors & emergency vehicles. This is NOT a Show and Shine, there are no entrant fees, no judging and there are no show prizes and no trophies. There will be raffles to raise money and gold coin donations, the proceeds going towards new music equipment for the Lavington Public School who have kindly allowed us the use of their grounds and facilities, and to local charities. The event is on Sunday 21st April 2013 from 10am to 3pm at Lavington Public School, corner of Urana Road and Hague Street, Lavington NSW 2641. Vehicles will be on show for the duration of the event and should be set up and on display prior to Public Entry at 10am. Due to Public Liability and OH&S requirements there is to be no movement of vehicles within the main car show area from 10am until 2:30pm. Please bring your items of interest to display, club banners, club promotional and information sheets to hand out, membership forms, flyers of coming events, photographs, magazines, newsletters and club memorabilia. This event is free to clubs, their members and participating enthusiasts. Morning tea will be provided by our club for your enjoyment. Each person will receive a voucher on arrival, for the driver and passengers of participating vehicles and members of clubs with displays, to be exchanged for morning tea. Enjoy! Public: Public Entry is by Gold Coin Donation and there will be a small charge for Morning Tea. Lunch: Our Club Members and Volunteers will be at the BBQ cooking snags and burgers which will be available for purchase at a small charge. Enquiries and numbers of vehicles and people attending to Harry please on 0411 746 286 or hgreenhalgh2@bigpond.com by Sunday 7th April for catering and organising purposes. We would be grateful if you would also promote this event to other clubs, members, enthusiasts, friends, family and public, in your magazines, newsletters, websites and emails. This is an alcohol free, dog free and smoke free event held in Education Department school grounds and anyone not complying with these requirements will be asked to leave the grounds.